Andras Schiff and Miklos Perenyi performed an all-Beethoven program Tuesday at the Seaport Museum. Beethoven sonatas come and go like weather fronts in Philadelphia. 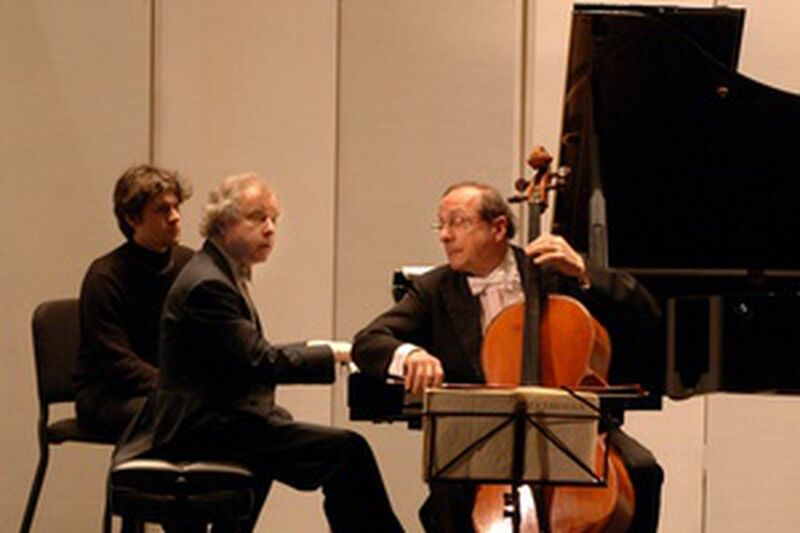 Less frequently (once a year or so), the city is visited by the beloved Hungarian pianist Andras Schiff. But Schiff's all-Beethoven concert, presented Tuesday by the Philadelphia Chamber Music Society at the Seaport Museum, was a rarer phenomenon, thanks to veteran Hungarian cellist Miklos Perenyi. The performance had all the wisdom and ability you could want, plus an in-the-moment presence that told you the experience wasn't the memory of a rehearsal but a rediscovery of music happening before your very ears. Perenyi has been easily encountered on recordings (from the Gyorgy Ligeti Cello Concerto to compilations like Relaxing Adagios); he played here in years past in chamber-music situations with Schiff. None, however, came close to Tuesday's concert, which was dedicated to peripheral Beethoven: The early Op. 5 No. 2 and oblique Op. 102 No. 2 were heard between themes and variations, two on tunes from Mozart's The Magic Flute, plus the Horn Sonata Op. 17 transcribed for cello. Amid this, value judgments on the music had to be suspended in the face of such imposing playing. Schiff's devotion to Beethoven in recent years was evident in the way he took each piece on its own terms, barely touching the pedals in the 1796 variations on Handel's Judas Maccabeus, suggesting the more blunt sound of a fortepiano, but going back to his more coloristically adept self for later works - all with the digital detail that has made him a distinguished Bach interpreter. As a presence, Perenyi is a slightly unkempt, low-key gentleman, often grappling for his glasses or suddenly discovering he was beginning on the wrong page of music. Then came the sound: Not gorgeous but sonorous and lean in its forthright sense of definition, more a vehicle for the music than an end in itself, and never too ungainly to dive into the tiniest details of the music (particularly appreciated in the condensed, late-period Op. 102 No. 2). The best moments were unexpected - a particularly vibrant note that made a complex transition fall naturally into place, or a recitative-like passage in Op. 5 No. 2 that was so emotionally packed it seemed to embody every question you've had in the last year. Such playing is a way of life, in this case arising from Perenyi's 40 years of concerts. Certain personalities need a particular setting (Schiff's Hamburg Steinway had to be inspiring) or level of maturity to reveal themselves. Many Eastern European musicians are unheard here out of a lack of management or a simple desire to stay home and teach. So who knows when we'll hear Perenyi again. But Tuesday's concert enters my pantheon of cello memories, from a 1970s Leonard Rose recital in Muncie, Ind., to Jean-Guihen Queyras' Haydn at the 2005 Utrecht Early Music Festival.